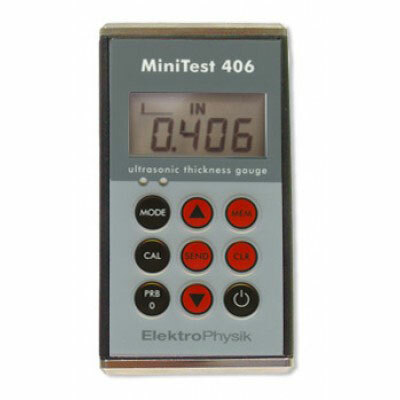 The MiniTest 406 is a simple to use hand-held Ultrasonic Thickness Gauge with the ability to measure through paint and coatings and eliminate the thickness of the paint or coating. The 406 uses a dual element style transducer. With the single press of a button, the 406 can be switched between pit or flaw mode ( pulse-echo), and through paint/coatings mode (echo-echo) for maximum inspection efficiency. The 406 is equipped with advanced features to make your job easer: Alarm mode, high speed scanning, and data send are the main features of the 406. Windows compatible data transfer program supplied at no additional cost. Size 2.5 x 4.5 x 1.25"
MiniTest 406 Ultrasonic Gauge, complete kit with with T-402-5507 probe - Please contact us for pricing and availability.